Aria Telecom delivers various range of USB headset with quality sounds and its noise cancelling mike filters out unwanted backgound sound for clear voice transmission. 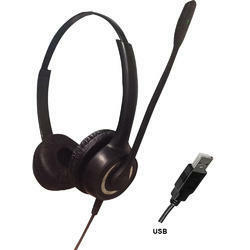 Aria USB call center headsets are durable, comfortable, light weight and delivers high quality sound. Aria USB headset available in binaural and monaural headset both. Our enterprise is a prominent manufacturer, exporting and importing an outstanding quality gamut of USB Headset in the international arena. This USB headset has jack for headset and computer connection. The provided USB headset has soft keys that can be tap with a soft press on the computer. Though, you need to install the driver for the part. Users can turn on or off the headset along with redial the latest caller immediately. Apart from this, clients can get this headset at nominal prices from us. With years of experience in the domain, we are manufacturing, exporting, and importing Telephone Headset - ARIA 18N-USB to the clients. This headset is manufacturer using quality approved components and parts. Our skilled professionals ensure to follow industry standards to offer quality headset to the customers. This headset can be used while listening to telephone, in cars, with computer and mostly used in call centers. The offered headset is equipped with rubber holders, long communication 3.5mm cable, USB pin, and RJ connector.